More than eleven years after its publication on this website and an ever increasing success, the 3 - 5W Class-A Audio Amplifier has undergone some small modifications (the addition of R1, Q2, R6 and the substitution of Q4 with a Darlington transistor) capable of producing a major improvement. In fact, the open-loop gain was increased, distortion figures at all power levels were dramatically reduced (e.g. up to 30 times @ 500mW), current drawing was reduced to less than 500mA, maximum output power was pushed up to 7.2W RMS into 8 Ohm load and input sensitivity was fixed to about 250mV RMS: in this way a CD player or Tuner can be directly connected to the amplifier input without the need of a preamplifier. The reduced current consumption allowed the use of an ultra-simple but very efficient regulated power supply employing a common LM317 IC, capable of driving, with a heatsink of modest size, two amplifiers. The power supply voltage of the amplifier must be set exactly to 24V by means of Trimmer R2, visible in the Power Supply Circuit diagram shown below. In the amplifier, Trimmer R1 was added to obtain, with reasonable certainty, the maximum output power possible (7.2W RMS). By means of this component the voltage at the positive lead of C6 must be set exactly at one half the supply voltage, i.e. 12V (with P1 turned fully anticlockwise). The regulated power supply circuit is straightforward. Parts values suggested are suited to power a stereo version of this design. With both amplifiers connected to the regulated power supply, adjust Trimmer R1 to obtain exactly 24V at the output pin of IC1. Adjust R1 in each amplifier to obtain exactly 12V across C6 positive lead and negative ground. 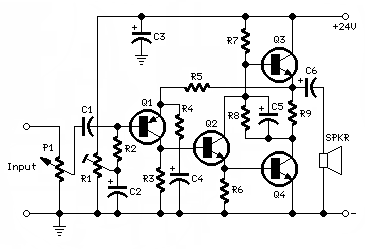 Total current drawing of each amplifier is about 450-500mA and should not require adjustment. Each output transistor (Q3 and Q4) must be mounted on a finned heatsink of 120x50x25mm. minimum dimensions.